In this podcast Kevin Jensen talks about creating one of the earliest rainbow websites originating from New Zealand. 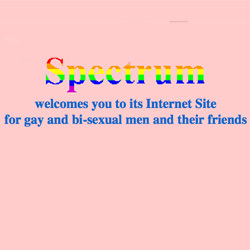 The website went live on 27 January 1996 and was for the Nelson-based Spectrum social and support group. The Internet Archive has a snapshot of the website from May 1997. There were other LGBTI rainbow websites being developed at the time (notably on nz.com) which can be found here.